The fan-favorite LCK team brought esports one step closer to the Olympics. 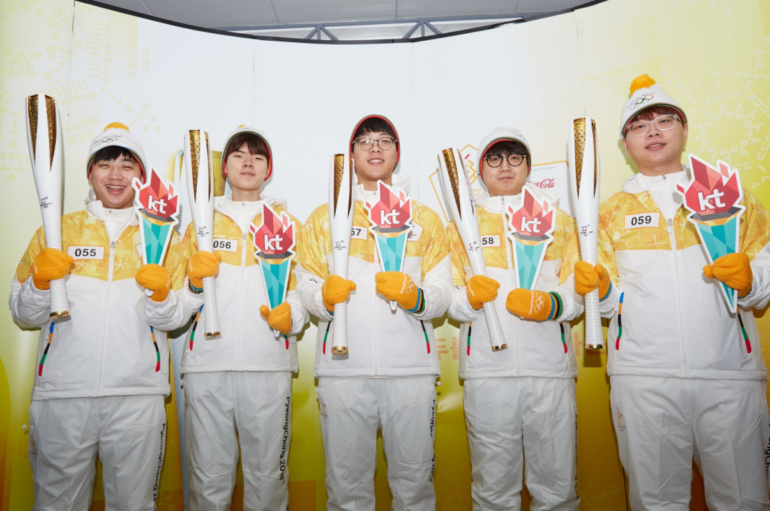 Korean League of Legends team KT Rolster have finished their leg of the 2018 Winter Olympics torch relay, according to the team’s Twitter account. They are the first esports roster to take part in an Olympic torch relay. The five starting KT Rolster players that carried torches are Song “Smeb” Kyung-ho, Go “Score” Dong-bin, Heo “PawN” Won-seok, Kim “Deft” Hyuk-kyu, and Cho “Mata” Se-hyeong. KT is one of the longest-standing organizations in the Korean esports scene, and it’s amassed an enormous community of fans—so it makes sense that this team was chosen to honor Korea with their own leg in the torch relay. Esports isn’t included in the Olympics yet, but having an esports team honored in this way is an important step in that direction. There’s at least a possibility that esports will be featured in the 2024 Olympics in Paris, though (as long as the games don’t “infringe on the Olympic values,” according to the IOC). One other major international sporting event has already included esports, however: 2017’s Asian Indoor Games, one of the largest indoor sports competitions in the world. Games featured at the event included Hearthstone, StarCraft 2, King of Fighters, and Dota 2. There’s also an Intel Extreme Masters (IEM) event being held in PyeongChang ahead of the Olympics as part of Intel’s partnership with the International Olympic Committee. Esports are incredibly popular in South Korea compared to most other countries, so an IEM tournament hosted in conjunction with the Olympics in PyeongChang isn’t actually a huge surprise. The Winter Olympics will begin on Feb. 9, and KT Rolster’s first match of the 2018 LCK Spring Split is Jan. 20.